C. F. Martin MTV-1 Unplugged Limited Edition Model Flat Top Acoustic Guitar (1996), made in Nazareth, PA, natural finish, rosewood amd mahogany backs, spruce top; mahogany neck with ebony fingerboard. 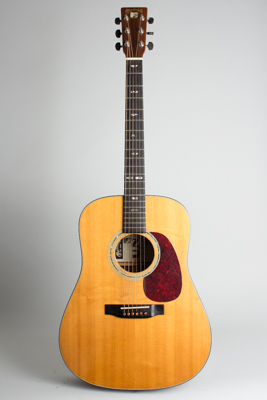 The unusual MTV-1 Dreadnought model was a Martin Limited Edition of 696 guitars built in 1996, as an attempt to tie-in with the then extremely popular "Unplugged" TV series, where the artists were often seen playing Martin guitars. This is number 575 and carries the special series label with the MTV trademarks signed by Chris Martin. It has a number of distinctive features, the most notable being the unique configuration of body woods: the treble half of the back and side is mahogany, while the bass half is rosewood. This was designed to exploit the perceived tonal difference in the woods, but is visually striking as well. The fairly delicate fingerboard inlay spells out "UNPLUGGED" running downwards in abalone, and the MTV logo is on the headstock in pearl. There is an abalone rosette and tortoise binding around the top and back, with a herringbone backstrip. There is an endpin jack installed, the original pickup was removed but still resides in the case pocket. This is not a vintage styled Martin per se, but a cool and unusual guitar with its own aesthetic, and an interesting souvenir of the time when MTV actually had something to do with music. Overall length is 40 3/4 in. (103.5 cm. ), 15 5/8 in. (39.7 cm.) wide at lower bout, and 5 in. (12.7 cm.) in depth at side, taken at the end block. Scale length is 25 1/2 in. (648 mm.). Width of nut is 1 11/16 in. (43 mm.). Very clean overall; original and complete except the pickup has been removed (but is included) and a strap button has been added to the heel. There is some very minor playwear and a few light scratches to the finish but overall this guitar has been very well cared for. A fine playing instrument with a very distinctive character, an interesting Martin experiment in "contemporizing" their appeal in the 1990's! Excellent Condition.